Having blocked fallopian tubes is one of the most common causes of infertility in women. In fact, almost 20% cases of female infertility are caused by this problem. It is in the fallopian tubes, also called oviducts and uterine tubes that the ovum and sperm converge and lead to fertilization. In addition, it helps the mature egg from the ovaries reach the uterus. An obstruction in the fallopian tube, however, prevents the egg from traveling down the tube. Plus, the blockage also prevents the sperm from reaching the egg, which in turn prevents fertilization. The condition is usually asymptomatic or may be accompanied by only mild symptoms such as abdominal pain during menstruation, irregular ovulation, and other problems associated with female reproductive health. These symptoms, however, do not necessarily point to blocked fallopian tubes. Thus, more often than not, the condition remains undiagnosed until one tries to conceive. This problem is generally diagnosed through two kinds of tests, that is, HSG (Hysterosalpingogram) test and an intra-vaginal ultrasound. Nevertheless, it is possible to conceive if there is blockage in only one of the two fallopian tubes. Partial blockage in the fallopian tubes can increase the chances of ectopic pregnancy and miscarriage. In addition, the fallopian tubes may become dilated and filled with fluid or pus causing blockage. This condition is called hydrosalpinx. Moreover, Chlamydia infection can cause distal tube obstruction. Blocked fallopian tubes can be treated with methods like Salpingostomy, Fimbrioplasty, Tubal Reanastomosis, Selective Tubal Cannulation, and so on. Nevertheless, there are certain natural treatments as well that can be used to get rid of this problem without undergoing surgical procedures. 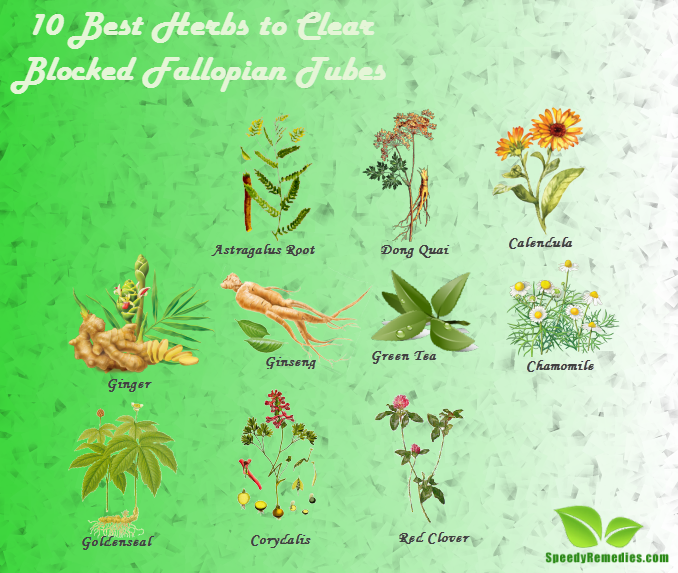 Here are a few herbs that can prove useful in curing tubular blockage by reducing inflammation and promoting blood circulation to the fallopian tubes. Besides, garlic can help fight against infections in the reproductive organs and boost immunity, and aid in detoxification (toxins encourage inflammation which in turn can cause scarring in the fallopian tubes). Similarly, corydalis root stimulates circulation, reduces abdominal pain, and helps flush out toxins from the reproductive system. Moreover, you can take herbal supplements such as dong quai capsules to reduce tissue congestion, eliminate muscle cramps, and improve circulation to the reproductive organs. Furthermore, wild yam and peony root promote normal hormone levels that support proper fallopian tube function. These herbal remedies can take months to work and their effectiveness shall depend on the severity of the blockage. You may prepare a fertility tonic by placing three parts of dried red clover leaves and blossoms, one part of dried red raspberry leaves, and half part of dried peppermint in a quart mason jar and fill it with boiling water. Seal the jar with its cap or lid and let the herbs steep for at least four hours. Finally, strain the solution and store it in the refrigerator. Drink almost 1-3 cups of this herbal tonic daily. Fertility cleansing aids in detoxification of the reproductive system. In addition, it increases circulation to the reproductive organs. In involves liver cleanse using herbs like milk thistle seed, yellow dock root, dandelion root, ginger root, burdock root, and licorice root, and uterine cleanse using dong quai root, peony root, goldenseal root, raspberry leaf, damiana leaf, and so on. It is recommended to use whole herbs for this process. This cleansing, though, should not be performed when taking hormonal medications. Castor oil therapy is another natural remedy for blocked fallopian tubes and problems like ovarian cysts, uterine fibroids, endometriosis, and so on. For this, you need to prepare a castor oil pack by soaking a piece of soft and clean cloth in castor oil. Place it on your lower abdomen and apply heat on top. It promotes circulation, stimulates the lymphatic system, facilitates tissue repair, and removes toxins and metabolic wastes from the reproductive organs. To increase the effectiveness of this treatment, you can use it in conjunction with self fertility massage. Daily fertility massage can help reduce fluid buildup in the fallopian tubes and break-up adhesions comprised of scar tissues. Getting rid of adhesions is essential because they cause the blockage in the fallopian tubes. Moreover, they cause the tubes to stick to other parts of the reproductive organs or internal tissues. It involves massaging the area above the fallopian tubes, ovaries, and uterus. Enzyme therapy works by supporting the reproductive health through the use of systemic enzymes. Thus, apart from blocked fallopian tubes, it can be used to deal with issues like endometriosis, uterine cysts, polycystic ovarian syndrome, recurrent miscarriages, abnormal blood clotting, etc. The enzyme serrapeptase, in particular, breaks down scar and cystic tissue. For best results, you need to take high quality systemic enzymes on an empty stomach. Follow this treatment for at least three months. In case you are going to have a surgery, discontinue this therapy about two weeks before the surgery. Acupuncture is good for regulating the functioning of the fallopian tubes. It helps increase circulation, breaks down the scar tissue and adhesions around the fallopian tubes, and reduces spasms of the fallopian tubes. Use of herbal tampons and douches are considered helpful in clearing the fallopian tubes by healing infections and breaking up scar tissues. You can either purchase herbal tampons or soak organic tampons in a herbal infusion prepared by mixing a variety of herbal teas like that of calendula flower, chamomile flower, goldenseal, osha root, garlic, red clover, etc. These tampons, however, should be used carefully and require immense self-care otherwise, they can increase the risk of infection by directing pathogens in the vaginal canal. These natural treatments, however, may not be effective in getting rid of this problem in case the fallopian tubes are severely twisted, or stuck to other tissues or organs in the body. Needless to say, make sure you consult your doctor before opting for the above-mentioned natural treatments. I ve been ving scanty menstruation for 5 yrs nw afta a pelvic inflammatory disease which i treated n ve taken different treatment bt my period is still nt flowing. I suspect i ve uterine scar or ovarian cyst. Pls Wat shuld i do 4 my period 2 flow again? n again i did an hormonal test i ws told my hormone is ok and i’m ovulating well.